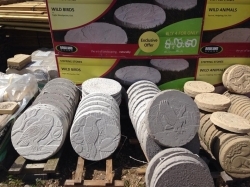 Wood and Moore Ltd have many years of experience in helping our based customers to be able to brighten up their gardens with our excellent landscaping materials. We are proud of our customer-focused approach and we will always work closely with all of our customers to allow us to tailor our services to meet your individual needs and requirements. With the wide range of landscaping materials that we have available that can be viewed in our extensive display area, we know that you can feel safe in the knowledge that we have something to suit both your requirements as well as your budget. You will not be disappointed by the excellent materials and services that we have on offer. Over the years we have developed an outstanding reputation for ourselves thanks to our excellent customer service and value for money. We are very proud to be able to say that a lot of our current customers have come to use our services throughout word of mouth recommendations from their friends and family. For the best landscaping materials in and around , call us today! If you would like to find more about any of the landscaping materials that we have on offer for our based customers, then please call us today on 01384 78519 or 01384 70807. One of our friendly team are just waiting to hear from you so that we can help, and answer any questions that you might have.